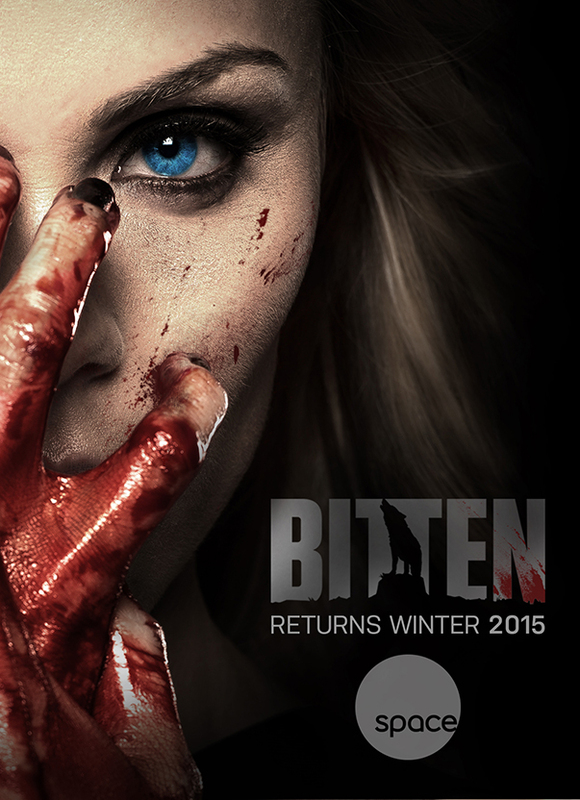 After reviewing the first season of Bitten last year, the television show based on the novel and characters created by Kelley Armstrong, I tried to keep an open mind to the inevitable changes that would come with the show’s re-interpretation of the story. The show’s writers killed off Antonio Sorrentino, who was Jeremy the Pack Alpha’s best friend and father to Nick, while choosing to keep Logan, one of the younger Pack members, alive. Both of these events are completely opposite to what happened in the book. Antonio is still alive in the series (to the best of my knowledge) and Logan, whose death in the novel was not only tragic and shocking to the Pack but more importantly it was a key catalyst for the war between the Mutts and the Pack. At the end of Season 1, the audience was left with a clear idea of how Season 2 would begin as Elena Michaels found the severed head of her former boyfriend, Philip, in her bed. Since Elena, had just come to terms with her wolf side and her tumultuous relationship with Clay, her mate, the grisly discovery of Philip’s remains pushed her over the edge. As Philip became one of the last casualties of the war between the Mutts and the Pack, this new twist in the story is bound to impact the reunion of Clay and Elena. We are also left wondering what will happen to Logan’s pregnant human girlfriend has she gets kidnapped by Jeremy Danver’s sadistic father Malcolm, the mastermind behind the Mutt attack on the Pack. As alpha, Jeremy is left cleaning up the mess left over from the Mutt attack at his family home Stonehaven, along with taking care of what is left of his Pack in the aftermath. For the most part, I thought the show improved over the course of the first season, and I found myself enjoying the story for what it was. So what do I think now that I’ve watched the first two episodes of Season 2? Honestly, I don’t know. There seems to be something missing in the chemistry between the Pack members, especially between Clay and Elena. The season begins with her seeking vengeance for Philip’s murder. Elena already felt guilty for turning Philip’s life upside down, but the responsibility that she now feels for his death is clearly taking its toll on her. In the novel, Elena chooses Clay when he is taken by the Mutts near the end of the first book. It becomes very clear that he is what she wants and that although they will never have a “fairytale” romance, Elena couldn’t deny that Clay was her mate any longer. In the novel, Elena felt badly because Philip got caught in the crossfire but he went on to live without her. In the show, she chooses Clay because she realizes that he bit her to save her being killed by Jeremy (a MAJOR deviation in story line from the novel) and that he took all the years of abuse from her because he was being loyal to his alpha. The complication of Philip’s murder is not helping Clay and Elena’s relationship. Now, Greyston Holt, who plays Clay Danvers, might be the best part of the show for me, as he is beautiful to look at and one of the better performers on the show. Steve Lund, who plays Nick Sorrentino, is also quite gorgeous and suprisingly, I’ve found his performances to be much better than I expected. In the novel, Nick is fun and immature whereas in the show, they have matured Nick since the death of his father, and that has been interesting to watch. The problem that I’m having is that I don’t think the show is being true to the relationships in the book. Character development was what I found to be the weakness in Season 1, so I guess it’s not that surprising this problem has carried over into the second season. The relationship between Clay and Elena is complicated, but ultimately, it is clear that they are meant to be together in the books. Yet, as I watch these characters who are supposed to be mates for life, it still feels like there’s something missing. As for the Pack, there’s no sense of “family” connecting its members. Jeremy still seems to feel the need to rule with a heavy hand to get everyone to do what he wants but that’s just not how the Pack operates in the novel. The Pack are a family, living together throughout the good times and bad, and that is something that the show’s writers need to work on if they want to project the same image. A new problem for the Pack this season comes in the form of some new supernatural characters who also originate from Armstrong’s “Women of the Otherworld” series. These characters show the wolves that they aren’t the only creatures hiding in plain sight of the humans. My biggest concern with the introduction of these new characters is that the show’s writers already have enough “balls in the air” so to speak and I have little confidence that they can handle the addition of any more characters. I will keep watching Season 2, if only to appease my curiosity, but if the show doesn’t improve the interaction between its characters making them more real and believable, I’m not sure there will be a Season 3 to watch.